Does anyone actually have the time to read the megatons of stuff out there on social platforms such as Twitter, LinkedIn, in blogs and elsewhere? That’s a valid question. But I’m a massive advocate of the importance of developing interesting content for your website and using social media to enable that content to reach your potential customers. Content marketing for small businesses works and we are proof. Our web traffic has quadrupled in the past 2 years and there has been an exponential growth in enquiries. Many of these have translated to good business. I think that’s a pretty compelling argument for getting involved. Don’t you? Not yet convinced? Below are our 6 Reasons Why Small Businesses Can’t Ignore Content Marketing and Social Media. I know that it costs time and free is not always a good thing. But writing interesting content that your customers might view on your website and social media isn’t something that needs to cost money. It isn’t a traditional marketing campaign for which you necessarily need to pay. You can use LinkedIn or Twitter ads and Facebook Boost to increase reach and pay for that but, in essence, you don’t have to fork out for content. And you do not necessarily need external help. The reality is that if you aren’t getting enough enquiries to sustain your business growth, you need to actively go out and get them. That will probably incur marketing costs and lead you to deploy activity ranging from telemarketing to exhibiting at an event to PPC to advertising to hiring a new sales person and much more. These are not inexpensive choices. However, the one thing that your blog and social media presence is, is free. It makes sense therefore to use this as one of your routes for lead generation as it just might reduce the need for more costly marketing. There is plenty of evidence to support the fact that people don’t like to be sold to. Increasingly we seek out suppliers via recommendation and through online search. That’s especially true for younger buyers. If potential buyers are using social media and looking at websites, they’re looking for evidence that you know your stuff. And that doesn’t mean that you have products and services that fit their needs. There are lots of competitors that also do that. More and more, we look for things that inform and entertain us. The only way therefore to differentiate is by showcasing your knowledge and adding value by providing useful tips and insight on your website and in social media channels. In truth, not every potential customer will read what you produce. However, a percentage will and the fact that they can see it lends credibility. Google also loves fresh, regularly updated content. If that pushes your website up the rankings onto Page 1, more of your potential customers will reach your site in the first place and come to you. I wrote this on my iPad while waiting for my car to be serviced. I write most of my blog posts on the tube going into London or over breakfast and finish them off at the office. I then distribute them across LinkedIn, Twitter, Google + and our Facebook page. Each blog post maybe takes 45 mins to an hour per week and social media posting maybe 10 mins. So isn’t it worth an hour or so per week? Credibility sells. It gets you onto that short-list or pitch. That’s especially the case where you are a service provider. A lot of our clients provide services that are very similar to their competitors and it can be difficult for a customer to choose. Hiring a new supplier can be an expensive decision and have serious consequences if the organisation or manager gets it wrong. Big companies don’t bring new suppliers on board unless they’ve checked them out. Of course, checks are primarily about the ability to deliver the work itself and financial stability and not about content. But once again, seeing relevant articles and tips like those in this article emphasise your credentials. It validates your place on a potential supplier short-list versus a similar organisation with no content other than service pages and ‘about us’ on its website. 70% of Google searches are allegedly for ‘local’ providers. So doesn’t it make sense that you work hard to ensure that when someone is looking for an Accountant in South London that your practice pops up on Page 1? Of course, it isn’t that simple. But you certainly have no chance of improving SEO without genuinely interesting content on your website. We have had an incredible increase in our incoming sales enquiries since we launched our new website in June. We have more than 100 blog posts, articles and tips on our website that we have written over the past 2 years. I target myself to write one article per week on the subjects I understand best like lead generation. That’s 52 per annum and 104 over the past 2 years. It isn’t a quick fix by any means but this strategy has resulted in a large number of new enquiries of which many are just what we’re looking for. That has significantly reduced my cost of marketing and increased the number of leads. So, isn’t now the time to take content marketing and social media seriously? Not everyone is a writer. So, if you do need help make sure you recruit someone or find a provider that can generate interesting content for you. If you’d like to see what content marketing can do for you and need some help implementing a digital strategy, take a look at the services provided by our sister company The Sticky Communication Agency. 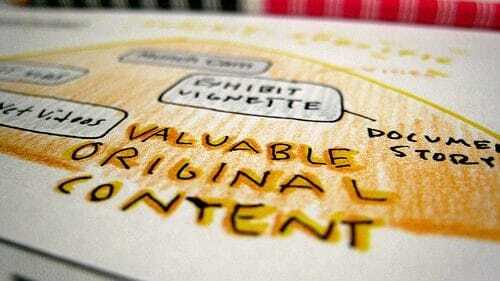 They deliver best practice content marketing strategy and implementation. If you’d like to know how GSA Business Development can help generate growth for your business or you’d like to book one of our new business development and marketing strategy workshops, contact us now on 0845 658 8192 or use the form on this site.